Located in the City’s dynamic arts and entertainment district, a block away from the VanAndel Arena, 38 is an entising location for sophisticated clientele. 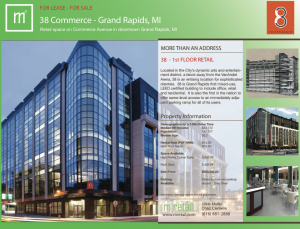 38 is Grand Rapids first mixed-use, LEED certified building to include office, retail and residential. It is also the first in the nation to offer same-level access to an immediately adjacent parking ramp for all of its users. Click Here for a Full Brochure.